Girl Guide a non-political and international youth association for women devoted to educational and social service. The membership of the association is open to all female irrespective of race, caste and creed. Bangladesh Girls Guide Association got approval of the Jatiya Sangsad as a national organisation in 1972 AD. This association was recognised by the Government of Bangladesh as an educational institution for women under Act 31 of 1973, and it secured the membership of the World Association in the same year. The whole range of activities of the World Girl Guide and Girl Scout is divided into five zones: Asia-Pacific, Africa, Europe, Western Hemisphere and Arabia. There are four world guide centres in these five zones. Bangladesh belongs to Asia-Pacific group. The world guide centre of this zone called 'Sangam' is situated at Puna in India. The Girl Guide programme is conducted in Bangladesh through seven zones: Dhaka city, Dhaka, Khulna, Chittagong, Barisal, Rajshahi and Sylhet. Girl Guide is an universal educational institution where the girls aged from 6 to 30 years are given such education and training that enable them to face any situation and develop themselves as suitable citizen of the changing world. The educational programme of the Girl Guide includes such supplementary subjects as democracy, human rights, internationalism and competition. The educational programme of Girl Guide is divided into four groups on the basis of age of the girls: (i) Yellow Bird (6-10 years), motto: to help others; (ii) Girl Guide (10-16 years), motto: to get always ready; (iii) Ranger (16-24 years), motto: social service; (iv) Leader Guide (24-30 years), motto: love for the Creator and devoted practice of religious behests. A trained guide continues to function as a guide throughout her life whose vow is to perform at least one meritorious work a day. As a part of this meritorious work the members of the Bangladesh Girls Guide Association contribute through the implementation of various projects to social development, preservation of healthy environment, service to old age, income augmentation programme and health services. Some of the notable projects of the Association are: (i) Safeguarding the rights of children. The project includes the establishment and maintenance of day care centres for the infants and guide homes as the shelters of the orphan and displaced girls, programme for social and mass education; (ii) Vocational training; (iii) Pollution free environment (plantation, sanitation, supply of pure drinking water and the use of smokeless furnace); (iv) Propagation of knowledge on health and nutrition; (v) Peace and culture. In addition, Girls Guide Association conducts social service programme as joint venture with different voluntary organisations. Girls Guide Association operates Girl Guiding Pragramme in every district of Bangladesh. As per statistics of 1999 the number of indoctrinated and trained girl guide is 42,794. Camping is an integral and vital part of the guide training programme. The association possesses a camp of its own at Baripara in Gazipur district. 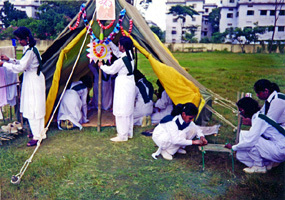 The participation in various types of camping is compulsory for the trainees in order to have field practice on the training received throughout the year. The apprentices under Yellow Bird group, Guide, Ranger, Guider and the Commissioners participating in group recreation and tent programme realise for the first time that the opportunity for getting responsibility is the reward of experience and quality in leadership. For the improvement of implementation skill in guide training activities, and to strengthen the organisational activities provisions are made for eight categories of training programme for the leader-guides: (i) Yellow Bird guider, (ii) Guide guider, (iii) Ranger guider, (iv) Local members and commissioners, (v) Camp craft, (vi) Warrant guide orientation, (vii) Lone trainer orientation, (viii) Junior training certificate course. This page was last modified on 24 September 2014, at 16:19.